Der Bundestag hat am 21. März eine hoch umstrittene Novelle des Telekommunikationsgesetzes und weiterer Gesetze beschlossen. Nach Meinung der Mehrheit des Bundestages soll eine Vielzahl von Polizeibehörden und Geheimdiensten Zugriff auf bestimmte Daten bekommen, die Provider über ihre Kunden gespeichert haben. Insbesondere sollen die Behörden abfragen dürfen, wer sich hinter Telefonnummern und IP-Adressen verbirgt, und auf PINs für Handys und andere “Sicherungscodes” zugreifen. Dieses Gesetz benötigt nun aber noch die Zustimmung des Bundesrats, um in Kraft treten zu können. Die Piraten-Fraktion im Landtag von NRW will dies verhindern und hat einen Entschließungsantrag eingebracht, mit dem der Landtag die Landesregierung auffordern soll, das Gesetz im Bundesrat abzulehnen. Der Hauptausschuss des Landtags hat zu dem Antrag der Piraten eine Sachverständigen-Anhörung angesetzt, die am 18. April um 10.30h im Düsseldorfer Landtag stattfinden wird. Ich habe zur Vorbereitung eine schriftliche Stellungnahme vorbereitet. Meiner Ansicht nach sind zwar einige der 12 Bedingungen, die die Piraten-Fraktion für eine Neuregelung der Bestandsdatenauskunft stellen will, überzogen. Aber trotzdem geht der Bundestag mit seiner Neuregelung deutlich zu weit. Verfassungsrechtlich wohl unzulässig dürfte etwa sein, dass die Behörden die Inhaber von IP-Adressen ohne jede neutrale Kontrolle bekommen sollen. Damit könnte jeder Polizeibeamte nach Belieben IPs abfragen – und dies sogar zur Verfolgung von Ordnungswidrigkeiten wie Falschparken oder An-den-Baum-Pinkeln (§ 118 Abs. 1 OWiG). Wer sich genauer für die verfassungsrechtlichen Fragen interessiert: hier meine Stellungnahme. Lesenswert ist außerdem die Stellungnahme von Prof. Dr. Matthias Bäcker für die Anhörung im Innenausschuss des Bundestages. Leider haben die Parlamentarier viele seiner Kritikpunkte nicht aufgegriffen. Insgesamt dürfte das Gesetz vor dem Bundesverfassungsgericht kaum vollständig Bestand haben. The widely used voice-over-IP and video chat software Skype is likely to provide a way to monitor Skype-internal conversations. It seems that the answer to the lively debated question whether there is an alternative to the so-called “source-interception” (trojan-based eavesdropping) is “yes”, at least from a technical point of view. In order to avoid the infiltration of computer systems by monitoring software which infringes fundamental rights, enforcement agencies should enter into negotiations with Skype, now a Microsoft subsidiary, to strive for the practical implementation of less intrusive surveillance measures. Skype, Skype’s local partner, or the operator or company facilitating your communication may provide personal data, communications content and/or traffic data to an appropriate judicial, law enforcement or government authority lawfully requesting such information. Skype will provide all reasonable assistance and information to fulfil this request and you hereby consent to such disclosure. However a definitive proof for such a function has thus far not become known publicly. Nevertheless, the system may already provide a technically simple way of listening to voice calls within the Skype network even without breaking the proprietary encryption of the audio data stream. The network operator, Skype, should be able to do this simply by secretly combining the “Skype In” and “Skype Out” features. The “Skype In” and “Skype Out” call routing options are used to make calls from within the Skype network to the “normal” telephone network. For Skype-Out, the Skype user connects to an extension designated by a classic telephone number. With Skype-In things are just the other way round: A “normal” telephone number is assigned to a Skype user name, thus calls to this number are put through over the Skype network to a Skype client that has registered with the respective associated Skype username. Both Skype-In and Skype-Out connections technically require the use of a gateway between the Skype network and the conventional telephone network. In detail two separate connections are established which are both linked to the gateway at one end, namely a Skype VoIP connection between the gateway and the Skype client as well as a normal telephone connection between the gateway and the called extension. The latter compound in turn requires that the encrypted Skype connection ends at the gateway: The – as far as is known, as such, secure – encryption therefore ends at the gateway to the traditional telephone network, where a plaintext audio signal can be retrieved (possibly digital, but certainly not encrypted). It follows first that this setup allows for Skype-In and Skype-Out calls to be tapped at the gateway, at least from a technical perspective, with a “normal” telephone surveillance setup. From this finding, however, follows at once that even network-internal Skype conversations can be intercepted. For this, the Skype network – always acting as a dispatcher between the clients involved while connecting two endpoints on the Skype network – just secretly instructs both clients not to establish a direct & encrypted connection between one another. Rather each one is forced to establish, without this fact being visible to the user, a connection directed to the regular telephone network gateway. This is technically pretty straightforward – the network only needs to indicate the gateway as the desired endpoint to the calling client instead of the actual addressee’s client. The called Skype client in turn is tricked into establishing a Skype-in ​​connection. Thirdly, both connections need to be switched together on the Skype gateway “in silence”, creating the impression that a highly secure direct connection had been established. In fact, however, the Skype operator sets up a a man-in-the-middle attack against Skype network internal connections, because at the intersection of the two “legs” of the connection, the Skype has full control over a plaintext audio signal. This signal can then by tapped by classic means of interception. I have no information on whether Skype has already implemented this possibility. To me it seems logical, however, that if Skype-In and Skype-Out are considered as given, such eavesdropping could be achieved without any or at most minimal changes to the clients. The changes should essentially be to hide away any clues of Skype-In or Skype-Out from the user interface. Technically speaking, this solution makes use of the Skype client being no open software but rather a “black box” from the user perspective. In particular, the user has no ways to independently authenticate the remote party. Thus Skype seems to be able to indicate arbitrary remote parties instead of the desired addressee as the endpoint of an outgoing connection – including the Skype Out / eavesdropping gateway. Overall, it can therefore be assumed with great probability that the implementation of a monitoring interface for calls within the Skype network would require minimal changes at best, if such a function has not yet been implemented. I’m looking forward to your feedback about this! If my thoughts are true, the use of trojans in order to monitor Skype traffic appears as disproportionate. Security authorities are rather required to set up technical and administrative details with Skype to put such tapping in place. Skype’s willingness to cooperate is rather likely as it’s now a Microsoft subsidiary, and German public administration spends many millions of euros each year on Microsoft software. In der heutigen Aktuellen Stunde des Deutschen Bundestages vertrat ein Redner die Auffassung, die handelnden Personen des CCC könnten sich der Strafvereitelung schuldig gemacht haben, indem sie den verfassungswidrigen Einsatz von Staatstrojanern sowie die Software selber öffentlich gemacht haben. Diese Idee politisch zu bewerten steht mir nicht zu; rechtlich jedenfalls kann dies nicht überzeugen. Eine Strafbarkeit wegen Strafvereitelung nach § 258 StGB würde direkten Vorsatz voraussetzen, die Bestrafung Dritter zu verhindern: Die handelnden Personen müssten also gewollt oder als sicher vorausgesehen haben, dass konkrete Ermittlungen gefährdet werden. Nun kenne ich die Interna des CCC natürlich nicht. Allerdings liegt dieser Gedanke fern: Von Einzelheiten der mit dem betroffenen Trojaner geführten Ermittlungsverfahrens wussten die CCCler offenbar nichts, denn die Festplatten waren ihnen durchweg zugespielt worden, ohne dass sie dabei von irgendeinem Verfahrensbezug erfahren hätten. Die einzige Ausnahme bildet das Landshuter Verfahren – hier allerdings war der Trojaner-Einsatz bereits beendet, sodass auch hier keine Beweiserhebungen mehr vereitelt wurden. Was etwaige andere Verfahren angeht, in denen dieselbe Software eingesetzt wurde, so hat der CCC durch rechtzeitige Information des Bundesinnenministeriums gerade verhindert, dass die Ermittlungen z.B. durch eine Warnung eines Antivirusprogramms aufgedeckt wurden. Vor allem aber scheint mir rechtlich folgender Gedanke von Bedeutung: Sicherlich hat die Aufdeckung des vom CCC analysierten Trojaners dazu geführt, dass dieser nicht mehr eingesetzt werden kann. Eine Strafvereitelung liegt darin aber schon deshalb nicht, weil die mit dieser Software erhobenen “Beweise” ohnehin strafprozessual unverwertbar sein dürften, sodass aus ihrer Nichterhebung auch kein Schaden für die Strafverfolgung entsteht. Denn jenseits der Debatte um die – ebenfalls zu verneinende – Zulässigkeit der Quellen-TKÜ nach der StPO ermöglichte der konkret veröffentlichte Trojaner “Application Shots”. Das aber wäre nur im Rahmen einer Online-Durchsuchung rechtlich zulässig gewesen, für die es in der Strafprozessordnung eindeutig – und insoweit auch unstreitig – keine Grundlage gibt. Außerdem hat die Analyse des CCC offen gelegt, dass der Trojaner über eine verfassungsrechtlich in keinem Falle zulässige Funktion zum beliebigen Manipulieren des Zielsystems verfügte. Der vieltausendfache Einsatz der “Application Shot”-Funktion verletzte schließlich auch zumindest im Landshuter Verfahren die Vorgaben des ermittlungsrichterlichen Beschlusses. Nun kennt die StPO zwar kein generelles Verwertungsverbot für rechtwidrig erhobene Beweise; vielmehr geht der BGH von einer Abwägung zwischen Rechtsverstoß und Schwere des Tatvorwurfs aus, soweit kein gesetzliches Verwertungsverbot eingreift. Angesichts der beispiellosen Schwere der Rechtsverstöße, bei denen klare Vorgaben des BVerfG missachtet und diese Verstöße zum Teil auch noch in der Software bewusst verschleiert wurden, dürfte die Abwägung hier jedenfalls ergeben, dass die per Trojaner möglicherweise zu erlangenden “Beweise” ohnehin nicht hätten verwertet werden dürfen. Dann aber macht es keinen Unterschied, ob gleich ihre Erhebung vereitelt wird – eine Strafvereitelung scheidet aus. Schließlich bleibt auch daran zu denken, dass der Einsatz der Trojaner seinerseits rechtwidrig war – dann wären die CCCler, die deren weiteren Einsatz verhinderten, je nach den genauen Umständen des Einzelfalls auch wegen Nothilfe (§ 32 StGB) gerechtfertigt. Insofern dürften sich die Trojaner-Buster vom CCC zurücklehnen können – und die Ermittler ebenfalls, können und müssen sie doch entsprechende Verfahren gegen die beteiligten Personen sogleich wieder einstellen (§ 170 Abs. 2 StPO). Dies dürfte zu einiger Erleichterung führen, denn welcher Staatsanwalt mag sich schon dem naheliegenden Vorwurf aussetzen, er verfolge ausgerechnet diejenigen, die sich für verfassungsmäßige Zustände bei den Strafverfolgungsbehörden engagieren? Aus der Sicht der Öffentlichkeit würde ein Verfahren gegen die CCCler jedenfalls den Rechtsstaat geradezu auf den Kopf stellen. 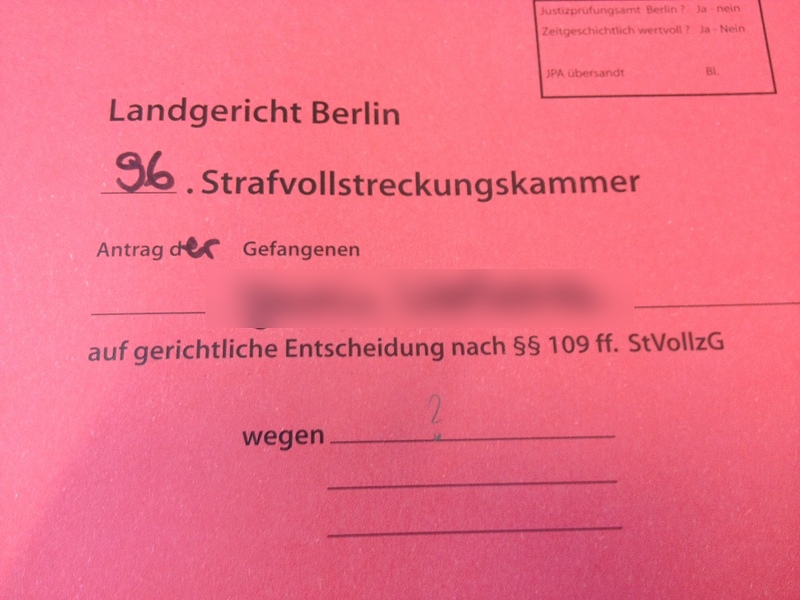 Die Beweiskette von mir zum CCC ist dabei lückenlos dokumentiert. Wie bereits Ende Januar veröffentlicht wurde, umfasste die – ihrerseits nach Meinung von Verfassungsrechtlern bereits rechtswidrige – richterliche Genehmigung nur das Abhören der Telekommunikation. Trotzdem haben die Ermittlungsbehörden auch von der nunmehr eindeutig verfassungswidrigen Screenshot-Funktion Gebrauch gemacht. Die auf diese illegale Weise erlangten Beweismittel wurden zum Gegenstand der Ermittlungsakte gemacht. Aufgespielt wurde der Trojaner bei Gelegenheit einer Kontrolle meines Mandanten durch den Zoll auf dem Münchener Flughafen. Auch wenn die Maßnahme selbst von bayerischen Behörden kontrolliert wurde, so steht für mich außer Frage, dass Stellen des Bundes – etwa der Zoll bzw. das Zollkriminalamt – im Wege der Amtshilfe beteiligt waren. Hierfür spricht aus meiner Sicht nicht zuletzt, dass dieselbe Software aus verschiedenen Bundesländern zum CCC gelangte. Nachdem ich aufgrund der Aktenlage erkannt hatte, dass Screenshots angefertigt worden waren, war mir bewusst, dass hier durch einen Trojaner der Laptop manipuliert war. Ich bedanke mich bei dem CCC, dass dieser bereit war – quasi als Gutachter – die Fähigkeit des Trojaners zu analysieren. Durch diese Analyse konnte möglicherweise eine starke Kompetenzüberschreitung bayrischer Behörden aufgedeckt werden. Die Ex-SED-PDS feiert einen Despoten? Hässlich, zumal in der heißen Phase des Berliner Wahlkampfs – und zumal in einer Stadt, die eine soziale Politik zwar gut vertragen kann, aber auch wahrlich genug schmerzliche Erfahrungen mit dem Stalinismus machen musste. Es fragt sich nur, ob der angesichts seiner vorgestrigen Formulierungen fast wie Realsatire anmutende Text überhaupt authentisch ist: Eigentlich kann ja kaum bei Trost sein, wer soetwas schreibt. Das muss aber nichts heißen – laut Wikipedia verfügt Kuba kaum über eine vernünftige Anbindung an das Internet, sodass eine auch physisch in Kuba betriebene Seite vermutlich deutlich schlechter erreichbar wäre als eine Seite, deren Server in Kanada steht. Insofern spricht aus technischer Sicht nichts dagegen, dass die Seite der kubanischen Botschaft in Deutschland offiziell ist. Bliebe nur zu klären, aus wessen Feder der Text stammt, der den beiden Linkspartei-Chefs noch einige Kopfschmerzen bereiten dürfte.